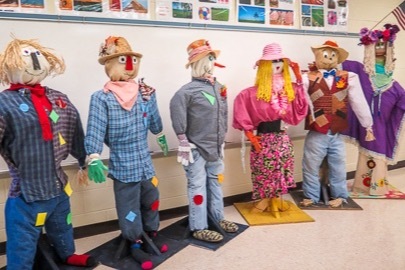 For the 6th year, elementary school children will build scarecrows that will be auctioned to raise funds to support the art programs in two elementary schools--Townsend and Walland, TN. Art encourages children to engage in schools and to expand their problem solving and team building skills. The Townsend Artisan Guild and USBank are supplying supplies and volunteer time to compliment the art teacher's efforts and the children's creativity. 100% of your contributions will be directed to the art programs at the two schools. The children look forward to this at the beginning of each school year and remember our volunteers from year to year. This is an initiative by the Townsend Artisan Guild and USBank to encourage self expression and excitement about education in our rural community and to support the arts for future generations. And now for the final stretch! Would you be willing to help art teachers inspire creative thinking, team work, and finding fun in school. Supplies are needed. Any level of donation will help! 100% of all donations will go to the art program. 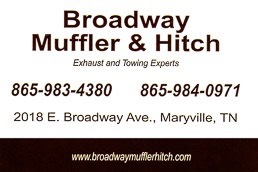 Broadway Muffler & Hitch has challenged businesses in Maryville and Townsend to support the arts in our Schools! Thanks for your support! We are one third of the way towards our goal--and the scarecrows have just been completed at Townsend Elementary.